You should be redirected automatically in a few moments, but if not, please click here to see if Latest Liverpool Stories has made the transition. The Hunt! project is a new initiative that wants to unearth Toxteth’s past as a hunting park for kings and nobles. They recently organised a trip to Lathom Castle (or the site of it), which is reputed to have been the biggest castle in England. It’s now little more than archaeological remains below Lathom House. Read all about their visit to Lathom House on the Hunt! Blog. West Kirby Museum opened in July, which Seven Streets described as “a small, but perfectly formed, little enclave in the gorgeous and well ancient St Bridgets’ Church”. The famous hog back stone is on view, as well as a plethora of medieval and stone artefacts. The church itself is also well worth a visit. Read Seven Streets’ summary of the museum for more info. 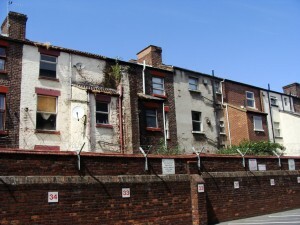 The Anfield area of Liverpool has had more than its fair share of recent ups and downs, and Peter McGurk discusses the latest plans to renovate the local housing. He’s worried about a lack of useful standards, and about a reduction in the number of people living in Anfield when house sizes are increased via knocking through small terraces. Peter sees similarities with Fenway Park, the baseball ground renovated (rather than moved) by Anfield’s new owners FSG. Reader Peter’s opinions on Anfield on his blog. The blog ‘A Sense of Place’ is always interesting, and often moving. There have been two recent posts with historic interest. The first is a brief tour of the Wavertree Mystery, a field (also, more officially, known as the Wavertree Playground) donated to the city by an anonymous benefactor. The second post is a photo essay of one of Ronnie Hughes’ regular walks. It takes in more than the usual number of historic buildings, and highlights Liverpool’s amazing diversity, from ‘rural-looking’ warehouses to the ultra-modern Liverpool One area. You can find both the tour of the Mystery, and the Liverpool walk on A Sense of Place. I recommend you subscribe to that blog! Finally, English Heritage are keen to promote ways of finding out about your house’s history. You may not think your own home has much of a past, especially if you live in a very modern building, but it’s all part of the Liverpool story, so think about what you can find out, especially if you’re in a Victorian terrace or a Georgian classic! There’s a Your Home’s History page to get you started on the English Heritage website, and an EH staff member (and friend and former colleague of mine) Kate Bevan shows you how to go about researching your home’s past life on the Heritage Calling blog. Well, that’s it for this time. If you see any interesting stories while surfing the World Wide Web, do let me know via the Contact page, Twitter or Facebook, or leave a comment on these stories below! If you’re interested in your home’s history, have a look at my review of The English Semi-Detached House from 2009. It’s a great book, and an easy read, whether or not you live in a semi yourself. You can buy the book from Amazon by clicking on the cover on the left. A small commission comes the way of this website, to help support its upkeep!